With our current health care system facing an overwhelming number of older adults living with disability, Kristen Beavers aims to keep people living independently as long as possible. She is broadly interested in understanding how nutrition and exercise relate to prevention and causes of disease and disability in older adults, and is actively working to optimize weight loss strategies for this population. 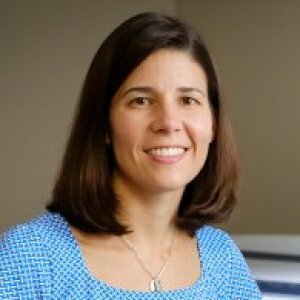 By training, she is a registered dietitian and certified personal trainer, and has been continuously funded by the National Institutes on Aging since 2010 to understand the effects of intentional weight loss on changes in several indicators of health, including body composition, cardiometabolic fitness, and functional decline. Her current research focuses on the effects of exercise type (resistance training or aerobic training) during weight loss on bone health, as well as whether a high-protein diet can preserve muscle mass and mobility in older adults with obesity. In sum, if there’s a lifestyle-based strategy that can help older adults lose fat, while keeping muscle and bone, Beavers wants to find it. Seniors who want to lose weight should hit the weight room while they cut calories, a new study suggests. Older folks who performed resistance training while dieting were able to lose fat but still preserve most of their lean muscle mass, compared with those who walked for exercise, researchers report. Losing weight later in life may depend more on lifting weights than walking, according to Wake Forest University researchers. Researchers conducted an 18-month study of 249 adults in their 60s who were either overweight or obese. They found that combining weight-machine workouts with restricting calories contributed to not only less muscle loss, but also significant fat loss. That’s when compared with weight loss alone. While sustained weight loss at any age is linked to a host of benefits like improved heart health, fewer orthopedic problems and even better mental health, weight loss isn’t always recommended in older age because it’s also associated with muscle and bone loss, frailty and disease. What’s more, if older adults regain the weight they lose, they’re even more likely than younger populations to pack it back on in fat, not muscle or bone. Weight cycling and regaining after a period of intentional weight loss is associated with worse physical function in women and weaker grip strength in men with diabetes, according to research in Obesity Science & Practice. Older adults who diet and exercise are more likely to experience bone loss if they engage in aerobic training than resistance training. After 5 months, bone mineral density showed a modest decrease among those in an aerobic training plus calorie restriction group. Walking slower is more than a sign of getting older — it could be a sign of increased thigh fat. Study authors found an “increase in fat throughout the thigh is predictive of mobility loss in otherwise healthy older adults,” according to a press release. Slower walking speeds have been linked to disability, nursing home admission and death, lead author Kristen Beavers told Huff/Post50 in an email interview.